Naturalized in California. Present in 4 counties according to Calflora. Native to Central America and naturalized in Hawaii, Australia, New Zealand and Africa. Naturalized in California. Present in 4 counties according to Calflora Native to Central America and naturalized in Hawaii, Australia, New Zealand and Africa, however none of the locations in GBIF match California's climate. P. tarminiana is now recognized as the only banana passionfruit taxon in Hawaii (HEAR, 2012) and, since its introduction there in the early 1900s, it has spread to infest thousands of acres of native forest (HEAR, 2012). PIER (2012) has assessed its weed risk assessment score at a very high 24.
d'Eeckenbrugge, G. Coppens, Barney V. E., Jorgensen P. Moller, & MacDougal J. M. (2001). Passiflora tarminiana, a new cultivated species of Passiflora subgenus Tacsonia (Passifloraceae). Novon. 11, 8–15. Although P. tarminana is considered invasive in Hawaii and New Zealand, none of those areas are in climates which match California. Passiflora subpeltata is native to Brazil and is escaping cultivation and is "widespread along the coast on rainforest margins and moist open forest" in Australia in climates which match California. Richardson, F.. J., Richardson R. G., & Shepherd R. C. H. (2006). Weeds of the south-east: an identification guide for Australia. Although P. tarminana is naturalized in Hawaii, Australia, New Zealand and Africa, none of these regions match California's climate. However, in Hawaii, and increasingly elsewhere, its vigorous climbing and scrambling growth makes it an aggressive and damaging invader of forest and scrub once these environments have been opened up by natural or human disturbance. It has proved capable of smothering even tall forest trees in both tropical and sub-tropical climates. According to Binggeli (1997, in ISSG, 2012), P. tarminiana ‘suppresses tree regeneration, topples shallow-rooted trees, kills standing trees through shading and lowers species richness’ (CABI). There is no information on whether P. tarminana promotes or changes fire regimes. Some members of the Passiflora genus are noted as producing cyanide in all their parts as a protection against insects and animals eating them. There are no references specifically referring to P. tarminiana toxicity. There is no specific mention of this species impacting grazing, though it could hinder movement of cattle due to thick growth. P. tarminana over-tops and topples trees, and causes dense growth which would not allow human and animal passage. Global Compendium of Weeds, Hawaiian Ecosystems at Risk (HEAR) project, Pacific Island Ecosystems at Risk (PIER) (2007). 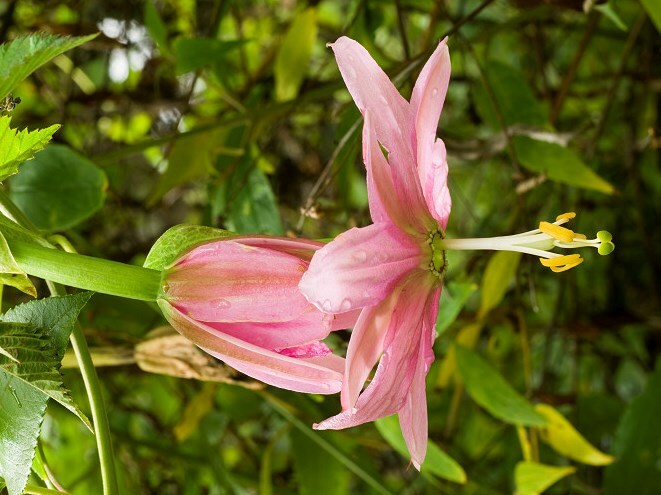 Invasive species information for Hawaii and the Pacific: Global Compendium of Weeds (GCW). The invasiveness of banana passionfruit is further exacerbated by the ability to utilize vegetative reproduction as stems as short as 5 cm that become detached or partially buried are able to re-root and continue growing. Beavon, M. (2007). Pollination and dispersal of the noxious vine Passiflora mollissima. The large edible fruits contain numerous seeds which readily germinate. P. tarminana fruits each can produce between 32 and 213 seeds with an average of 108 (Beavon 2007). Since the vines have indeterminate growth it is likely a plant could produce 10 or more fruits for a total of 1,000. Seeds require a short period of after-ripening. Germination is staggered and most seedlings emerge within 4 to 12 weeks. Plants can grow from seed to flowering in about one year (La Rosa, 1984). Plants can grow from seed to flowering in about one year (La Rosa, 1984). The same author found that in Hawaii all phases of flowering were concentrated in the drier summer months (May - August), and fruiting in the wet winter months (December - March). Another author notes, in Hawaii "Flowers can be found all months of the year and fruit is copiously produced." P. tarminana seed is spread by feral pigs and native birds in Hawaii (PIER, 2012), and by introduced feral pigs and Australian brush-tailed possums in New Zealand (Beavon 2007). Non-biotic natural dispersal is unlikely to occur, except to some degree by water, as this species tends to spread along water courses. The most likely avenue of introduction is deliberate actions by humans in importing seed or plants as a potential crop or as a garden ornamental. On the taxonomy, it is a little troubling, with GRIN having separate entries for P. tarminiana and Passiflora tripartita (Juss.) Poir. var. mollissima (Kunth) Holm-Niels. & P. Jorg., but USDA plants listing these as synonyms. PIER indicates that the problematic species is P. tarminiana, uses the common name banana poka, and some of the information is from sources attributed to P. mollissima. However, much of the PRE evidence is from Hawaii, so in either case, the scores are valid.